Adirondack Bears vs. Humans - Who's Winning? 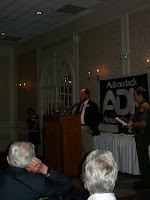 Last Saturday, I had a nice dinner and shot the above photo of the resident large mammal biologist, Ed Reed, accepting an award from the Adirondack Mountain Club. Ed also happens to be my deer, um dear, husband, so I was very pleased to see his exemplary work recognized. The Mountain Club was honoring themselves, the New York State Department of Environmental Conservation (NYSDEC), the Wildlife Conservation Society, Ed and his colleagues for recent black bear management work. About seven years ago, the human predilection to mimic the bears; hang out in the woods and sleep outside, was starting to cause major problems in the Adirondacks. The problems stemmed from an uptick in "bear/human interactions." Those interactions were not always pleasant ones. Turns out, most humans don't really want to be exactly like the bears and eat carrion and berries. Rather, most campers prefer to eat food carried in from civilization, like Cheez Whiz and Ritz crackers. Astute but rather large creatures, the bears decided it was a lot easier to steal Cheez Whiz and Ritz from the copy-cat campers than it was to dig around searching for carrion and eensy-bitsy berries, which don't go very far when you have all that bulk to maintain. As the number of campers in the High Peaks Region of the Adirondacks increased, so did the bears. Since Adirondack Black Bears are smarter than the average bear, it didn't take long for the number of empty pic-a-nic baskets to add up. No amount of hanging food in trees or on specially rigged lines kept Yogi and his friends at bay. Finally, one dry summer the bears started to get a tad aggressive about their dining options. One bear unfortunately had to be put down (shot) because he was venturing into lean-tos in search of Ritz, and bluff charging campers. Bluffing or not, black bears could potentially inflict a world of hurt on a measly human, so clearly something had to be done. Enter Ed and his NY State DEC Ranger friends. After much research and legislative wrangling, a new DEC Lands and Forest use regulation was enacted and implemented. The new regulation mandates the use of bear-resistant canisters in the Eastern High Peaks Wilderness of the Adirondacks for overnight campers from April 1 through November 30. An old communications professional, I know a public relations challenge when I see one. How to get the word out to all those campers who come from all over the world about the new bear-resistant gizmo reg? Well, DEC did a great job of spreading the word by partnering with the Adirondack Mountain Club and the Wildlife Conservation Society. Hence the award bestowed last week. The best part of this story is the latest news: the smartest of those smarter than the average bears, Mrs. Yellow-yellow, has already figured out how to break into one of the most popular brands of canisters. She is apparently conducting in-service education and seminars for her colleagues and has taught other bears how to get their dinner out of the canisters. So cool - I can't help being on the side of the bears since they were there first, and they are winning!!! Pictured with Ed is Mr. Ranger Jim Giglinto.